In 1840 John Kirby Farnell founded a London business making household goods. 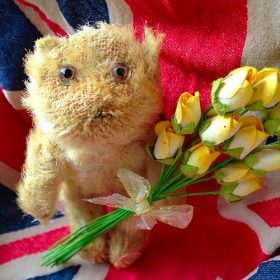 His daughter Agnes, aided by her brother Henry, switched the firm’s interest to soft toys and by 1908 achieved a place in teddy bear history by producing what are believed to be the first English teddy bears. These quickly became one of the firms best selling products , marketed from the early 1920s as Alpha bears. They were distinguished bears of high quality manufacture with humped backs, long muzzles and the distinctive closing seam down the tummy. In 1921 a Farnell bear was purchased by Dorothy Milne for her son Christopher Robin’s first birthday, and became Winnie the Pooh, world-renowned hero of A.A. Milne’s best selling books. 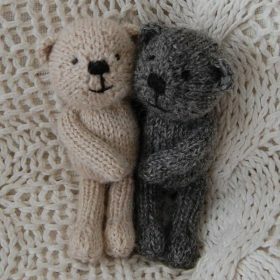 Farnell bears rarely retain their trademark label, but are identifiable by the characteristic shape and high quality of fabric and manufacture. Early Farnell bears still retain the original sheen and texture to their top quality mohair.